Michael Daventry gives the inside scoop on the Intelligence coup of the century. The spectacle of Benjamin Netanyahu barely able to contain his excitement as he paced back and forth around the stage, pointing out his props and slides, was remarkable enough. But that was as nothing compared with what was truly remarkable — an intelligence coup that is already regarded as legendary. The Israeli prime minister had just uncovered — literally, by pulling away dust sheets to reveal shelves of filing — the evidence that showed Iran had for years been engaged on a secret nuclear programme. 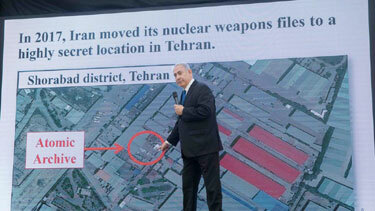 “Iran lied, big time,” Mr Netanyahu told a hastily-assembled room of journalists on Monday. “A few weeks ago, in a great intelligence achievement, Israel obtained half a ton of material”. His presentation was closely coordinated with the United States, coming just days before President Trump decides whether to abandon the international deal that was said by its supporters to contain Iran’s nuclear ambitions. Mr Netanyahu’s words were dramatic. But they barely came close to conveying the drama of the Mossad’s unprecedented operation. The cache — containing tens of thousands of pages, many of them handwritten — was snatched by Mossad agents in a single night, from a ramshackle warehouse in a suburb south of Tehran, the Iranian capital. Sources say the building had been under constant surveillance by Israeli intelligence from the moment it was first discovered in February 2016 until the decision to act was taken. That moment came one night in January this year. This was not a data transfer of the kind that has made the Mission Impossible movies so thrilling. The documents were not copied onto a portable hard drive, nor transferred electronically back to Israel. Every file and CD — weighing a collective half a ton — was transported physically in a single night. And not one of Mossad’s “human assets” — Israeli agents and Iranian informants — was harmed in the operation, intelligence minister Yisrael Katz told Israeli radio on Tuesday. It is no exaggeration to say that all of this happened under the Iranian government’s nose; Iran’s foreign ministry building was so close to the warehouse that the Mossad agents could have driven to it in the centre of Tehran in barely half an hour. “This was a highly complex operation, over a long period of time, in a deeply hostile environment,” said James Sorene, chief executive of the Bicom think-tank. “To remove so much physical material in such circumstances is nothing short of remarkable. 2 Feedbacks on "How Israel Stole Iran’s Secret Nuclear Files"
Iran will need to appoint a Special Persecutor to find out who collaborated with the Israelis. This has got to rank up there with Entebbe or the capture of Eichmann.